Nagasaki is located in the southwest of Japan. Embraced by mountains on one side, and bordered by the sea on the other, the prefecture is surrounded by stunning natural scenic beauty. Nagasaki was considered as Japan’s only window to the outside world during its period of national isolation from 1641 to 1859. Even today the influx of Chinese and western influence is deeply ingrained in many of its festivals and the natural environment. 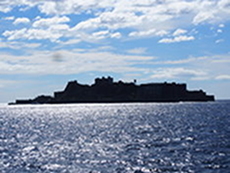 Hashima Island, also known by the nickname “Battleship Island” because of its shape, is a UNESCO World Heritage Site for the historical value of its industrial heritage. It has also received worldwide acclaim as the model for the “Dead City” in the James Bond movie “Skyfall”. Another not-to-be missed attraction is the 360o view over Nagasaki from the summit of Mt. Inasa which is widely regarded as one world’s best nightscapes, rivalling Monaco and Hong Kong. For more information about Nagasaki prefecture, see their official tourism website. Air - Nagasaki Airport is located about 30km from the centre of Nagasaki and easily reached by bus within 40 minutes. The airport has daily flights to Tokyo(Haneda), Osaka and other major cities in Japan. Click here for its English website. Rail - The journey time from Fukuoka is under two hours. Nagasaki Nightscape – Nagasaki was recognised as one of three cities with the most spectacular night views in the world. The best way to enjoy the views is to take the glass-panelled ropeway to the top of Mt. Inasa. 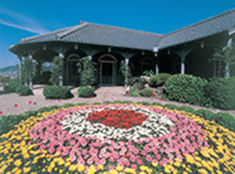 Glover Garden - The site was built to accommodate the first foreign settlers to Nagasaki during the Meiji Period. The foreign settlements were abolished in 1899, but the Western buildings remained, creating an international atmosphere. The garden has stunning views of Nagasaki port. Hashima Island, also known as Gunkanjima (Battleship Island), is a tiny fortress-like island off the coast of Nagasaki. Formerly a prosperous coal mining site, the island was suddenly closed down in 1974 and remained deserted until 2009. 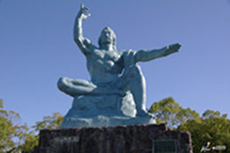 Heiwa Kinnen Zo - The statue was completed in 1955 by Seibo Kitamura, a locally born sculptor. The statue's right hand points to the threat of nuclear weapons while the extended left hand symbolizes eternal peace. The face symbolizes divine grace and the gently closed eyes offer a prayer for the repose of the bomb victims' souls.